Can you handle these sandals? Home > Blog > Can you handle these sandals? Footwear comes first for a lot of people. It’s certainly a smart place to start. That’s why Everything Summer Camp is sure to expand our footwear selection with only the top brands. Chaco has been crafting premium footwear since 1989. Check out what they’ve been up to lately with these three new sandals that we just started offering. Kids have a tendency to go rough on their footwear—especially at summer camp. 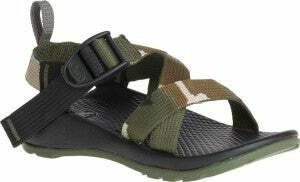 That’s why we brought on board the Kids Z1 as well as the Kids ZX/1 Eco Tread Sandals from their Z collection. 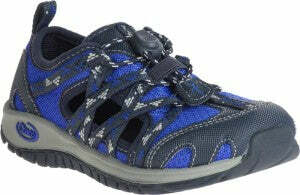 We also grabbed the Kids OutCross Sport Sandal. Give these three newcomers a nice warm welcome and check out the innovative features these sport sandals are sporting! Thanks to Chaco’s LUVSEAT™ platform, your feet are provided with lasting support from the arch which reinforces healthy posture and good body alignment. For a protective sandal that goes on with ease and off with just as much. Pick yours up right here! This Sandal is ready for anything it’s likely to encounter at camp. This Sandal boasts LUVSEAT™ platform support as well to make walking, running, skipping, jumping, and galloping all feel great. Check it out on our site right here. Designed to be worn with or without socks, comfort is as a big a deal to the Kids OutCross as it is to…well, kids! Going with the amphibious design, thi s airy shoe offers a durable cap for protection as well as open sides for efficient drainage and ventilation. Because of its semi-collapsible heel, the Kids OutCross allows for maximum on and off convenience. 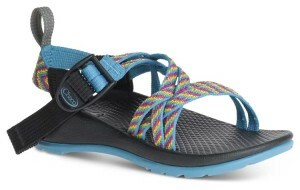 And Chaco gave this sandal the LUVSEAT™ platform too. Check it out further right here. Go with footwear that’s sure to feel great! Go Chaco! Enjoy browsing our footwear selection and, as always, thanks for reading.